Thule Carry All Box 150. The Carry All-Boxes are big volume luggage boxes. 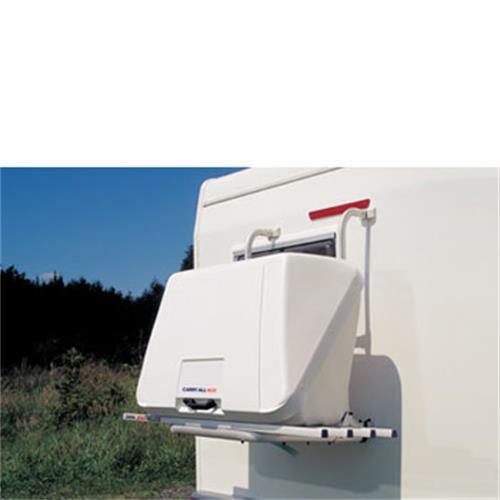 Because of the installation at accessible height, packing and use are very easy. The boxes can be installed on any bike rack or on an optional carrier frame, that is fixed to the vehicle wall. COMFORT: The box is mounted at a very convenient and accessible height ensuring ease of packing and use. Protection net supplied as standard with both types, for the best protection of your luggage. MOUNTING: The Carry-All Box can be mounted to any bikerack. An optional special carrier frame is seperately available. This frame is fixed t the vehicle wall. OPTIONS: On top of the the Carry-All Box 150 a carrier frame for 3 to 4 pairs of skis can be installed. The fixation is done on top of the box. REMARK: maximum loading capacity = max. loading capacity of bike rack minus wight of box!